I first discovered Creative Breads, located at the back of Shipley Health Store on Westgate, last September. I remember the day well. It was the first weekend of the Saltaire festival. We had returned from our holiday in France to find their flyer in our postbox and, keen to try something new, along with showing support for a new, local business, off we went to buy our lunch on a warm September morning. And what a lunch it was. We came away with a pork and herb sausage roll, a sausage sandwich, a three cheese toasties and a Portuguese egg roll. That I remember all four things, eight months later, shows what an impression they made. A tradition was born that day; if we are at home in Shipley on a Saturday we get our lunch from Creative Breads. That’s the rule. And it’s no exaggeration to say that in the subsequent months nothing has disappointed. And there’s not much we haven’t tried. So there was no hesitation about booking a table when we heard about their new venture; a pop-up restaurant. Dining for twelve people, six courses, no choice and no advance warning of the menu. We had absolute faith. Knowing the delicate touch and fantastic flavour combinations of the two talented chefs, Jez and Lisa, we were prepared to be impressed. We arrived at 7.30 and were greeted with a glass of Prosecco and a plate of appetisers; a few squares of focaccia bread served alongside wild garlic and chargrilled aubergine. 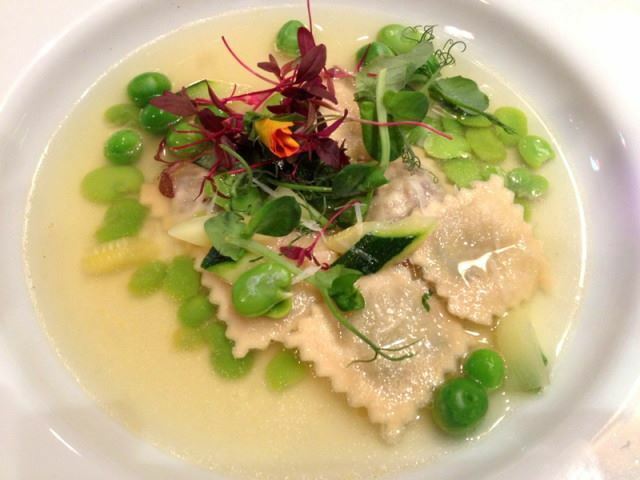 Then came the first course; freshly made ravioli served in a wonderfully light yet fragrant chicken broth and spring vegetables – peas and broad beans – that simply exploded in your mouth. The presentation was exquisite; it looked and tasted beautiful. Second course; black pudding (home-made) with fried gnocchi, artichoke and ricotta. Another winner. Carefully balanced flavours and textures and again, as visually delightful as it was delicious. Time for the third course; wild mushroom risotto – creamy and unctuous – served with a single, perfectly crisp slice of pancetta and a deep fried risotto ball. I have eaten my fair share of these in Italy – where my grandmother was from they are known as suppli, more commonly they’re known as arancini. No matter the name, they were among the best I have ever eaten. Perfectly crisp on the outside and meltingly rich on the inside. A triumph of a dish. Out came the fourth course; fritto misto served with salsa verde and almond aioli. Wonderfully light and crisp fried langoustine, calamari, and other morsels, perfectly accompanied by its two delicious sauces. Onto the fifth course; this time oxtail ragù with home-made tagliatelle. This dish was faultless. The sauce was rich, deep and full of flavour; the sort of flavour you only get from cooking something really, really slowly for a really, really long time. The fresh tagliatelle were silky smooth and perfectly thin. Three hours later we reached the sixth course and presented to us was a bitter chocolate tart served with one scoop each of lemon and coffee ice cream. This delicious pudding barely touched the sides of my mouth; three hours of drinking wine had taken its effect and so much was I craving that final sweet course that it had disappeared before I knew it. It melted in the mouth. We finished off with a first-rate espresso – not a given, even today – and then trundled home grateful that we only had to drag our full bellies a couple of hundred metres. On first consideration £40 per head might seem a lot; especially if you knew nothing of the skill and inventiveness that regularly comes out of this tiny kitchen. Was it worth it? Without a doubt, yes. These were some of the best dishes I can remember eating. The ingredients were first class, skill was aplenty and the service was impeccable; all eleven of us were served at the same time on every course and the atmosphere was relaxed. The chefs did their thing, bustling away throughout but remaining completely calm. And the fact that it was BYO (£5 corkage per person) kept the price down. If you live anywhere near Shipley, or you’re passing through, please pay Creative Breads a visit. They are doing wonderful things and we need to support these independent businesses. They are a dying breed. Get yourself a loaf of bread – it’s fantastic – or treat yourself to one of their mouth-watering sandwiches, soups or savouries and make sure you try one of their perfectly gooey chocolate brownies. And if you see an advert for another pop-up – go.